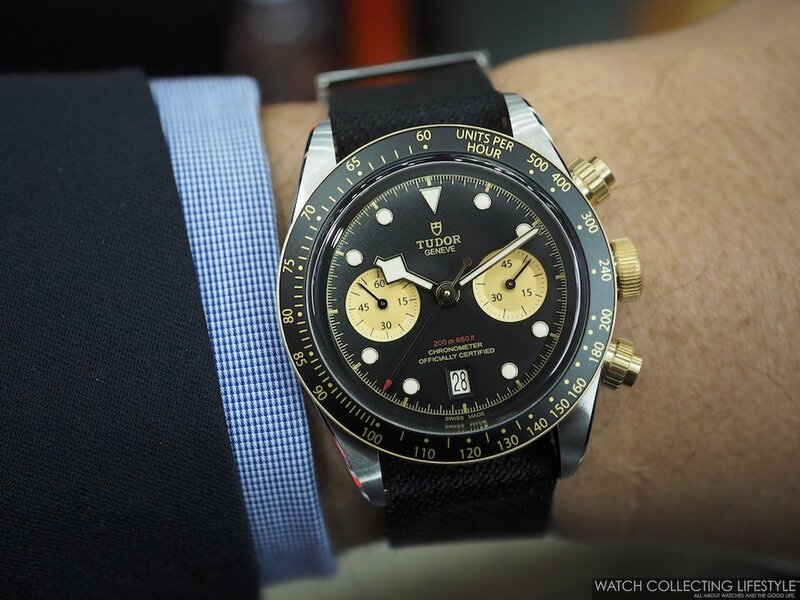 Insider: Tudor Black Bay Chrono Steel & Gold ref. M79363N. Reminiscent of Those Vintage Chronograph Days. The new Tudor Black Bay Chrono S&G —for steel and gold— is the newest addition to the Black Bay collection. With a two-tone look combining stainless steel and yellow gold, the new Tudor Black Bay Chrono Steel and Gold is an automatic 45-minute chronograph powered by the Tudor Manufacture Calibre MT5813 which is derived from the Breitling B01 as the result of a mutual collaboration between Tudor and Breitling. Regardless, this column-wheel chronograph with vertical clutch features Tudor finishing, Tudor regulating organ and a Tudor oscillating weight. The movement provides a power reserve of 70 hours when fully wound. The new Tudor Black Bay Chrono S&G is available in three different configurations, with matching steel and gold bracelet, with black jacquard fabric strap or with brown leather bund strap. The new Black Bay Chrono S&G is equipped with a 41 mm case in stainless steel and fitted with an 18K yellow gold solid gold bezel —with black anodized aluminum insert—, 18K yellow gold solid chrono pushers and with 18K yellow gold shell —capped— center links on its bracelet and its winding crown. When fitted with a riveted stainless steel bracelet, the end links feature solid 18K yellow gold as well as capped 18K yellow gold center links. Featuring a black matte dial with gold registers, the layout is of a bi-compax chronograph with 45-minute chrono register at 3 o’clock, running seconds register at 9 o’clock and date aperture at 6 o’clock. The whole watch is very vintage looking and especially the dial with its Tudor snowflake hour hand. The ‘millerighe’ screw-down chrono pushers also give the watch a very vintage Rolex Daytona air. On the wrist, the new Tudor Black Bay Chrono S&G ref. M79363N wears true to its size with strong vintage feel to it. While all three options are quite good, our favorite is the bracelet model followed by the black fabric strap. Not bad for an in-house chronograph with 18K yellow gold here and there. 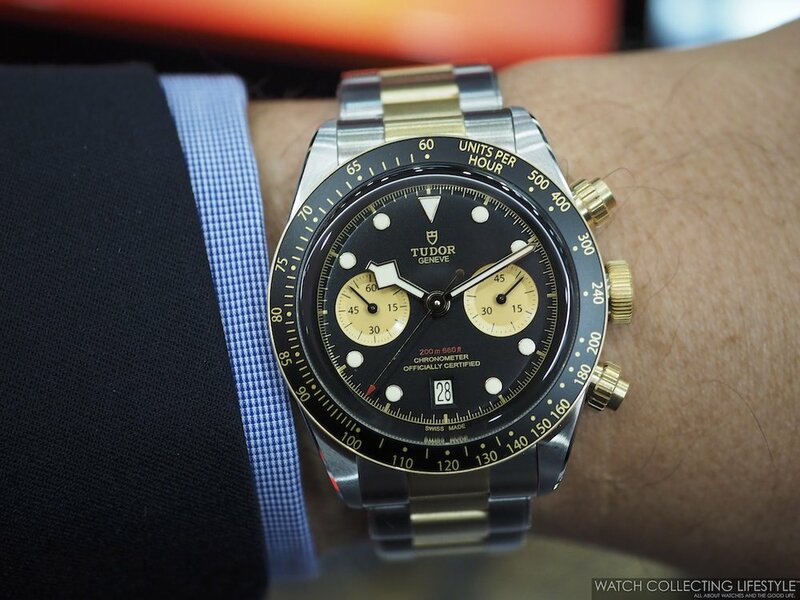 Posted on April 2, 2019 by Editor & Publisher and filed under Tudor and tagged Tudor Black Bay Chronograph Tudor Chronographs 2019 Mainstream Brands Tudor Black Bay Chrono Steel & Gold ref. M79363N Tudor Black Bay Chrono S&G ref. M79363N Most Popular.